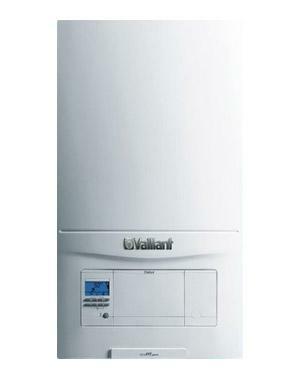 The ecoFIT pure is a boiler made by Vaillant. This boiler is a system gas condensing wall mounted boiler. With it being a highly reliable boiler coming with an output of 30kW and n efficiency rating of up to 89.3% you can be sure you're getting a good boiler. This boiler comes with a wide range of other outputs such as 12kW, 15kW, 18kW, 25kW and 30kW making it able to fit to just about anyones homes and needs. It comes with many ways to be able to fit in a wide range of houses such as its top and rear flue options on all the boiler models, helping to allow flexibility in where it can be sat and making it perfect for it to be hidden away in various property types. As well as this the units compact size means that it can fit in a standard sized cupboard as well as it having a small boiler footprint. This unit comes with a wide range of different things to make it a reliable boiler such as the automatic purging assistance and high spec aluminium heat exchanger making it a light weight installation, high quality and high efficiency, with a wide range of spare parts that are easily accessible meaning that the unit is easy to maintain. It comes with a clear led display, helping to offer visibility in dimly lit areas. It comes with a diagnosis for faults that are easily recognisable. As well as this it comes with a high specification aluminium heat exchanger that is designed to last longer and maintain easily as well as reduce your energy bills. Other things coming with the boiler to improve the efficiency are things like the high quality components that offer peace of mind for the lifetime of the boiler as well as industry leading flue lengths such as a 10m flue across all the ecofit pure outputs. It comes with a four sided cooling and water agitation on the heat exchanger thus reducing stress on the heat exchanger for a longer life reliability and less maintenance costs. It’s also compatible with Vaillant intelligent range of controls to help you save even more money and make the boiler even more efficient than it already is. This boiler comes with five years warranty to give you peace of mind that you’ve got a reliable boiler.